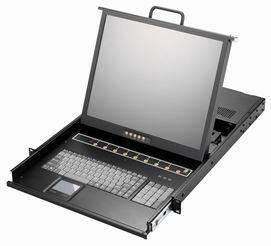 8 port PS2/ PS2 and USB COMBO KVM with military industrial grade production. Support Password protection and Server name. Support extra daisy chain port and no waste server port for expansion. Hot Plug- add or remove connected computer without powering off the KVM switch or computer. No software required. Easy computer selection via Front Push Button , Hot Key, OSD menu. Support PS/2 or USB (COMBO) cable to PC. Auto Scan mode. Easy to monitor Server Operation. Superior Video Bandwidth unto 200MHz. LED display for status monitor. Buzzer sound for Server switched confirmation.